Register today and save $10 with Early Bird registration! Conference 会議: 8:30 a.m.-5:30 p.m.
We will start with morning zazen sessions led by Abbot Kobori from Ryoukoin, Daitokuji Temple from Kyoto. You may meditate seated comfortably in a chair or bring a cushion to sit cross-legged on the stage of the auditorium. The zazen will be followed by the abbot's talk. Dr. Katsuhiro Yoshizawa's Special Lecture, "Pleasure and Appreciation: Inscribed Paintings as Tea Scrolls"
Dr. Isao Kumakura's Keynote Lecture, "Chanoyu and Zen"
Dr. Janet Ikeda, Washington & Lee University, "One brushstroke: Sen Sotan and Zen"
Ms. Lixia Dong, University of Arizona, "Chan, Poem and the Way of Tea: A Study of Jiaoran's Tea Poems"
Ms. Sara Klingenstein, Harvard University, "As though parting from a loved one: practicing the sense of loss"
During the lunch recess, the members of Kanshinkai from Ryoukoin, Daitokuji, will demonstrate the ryurei-style thin tea (usucha) preparation. 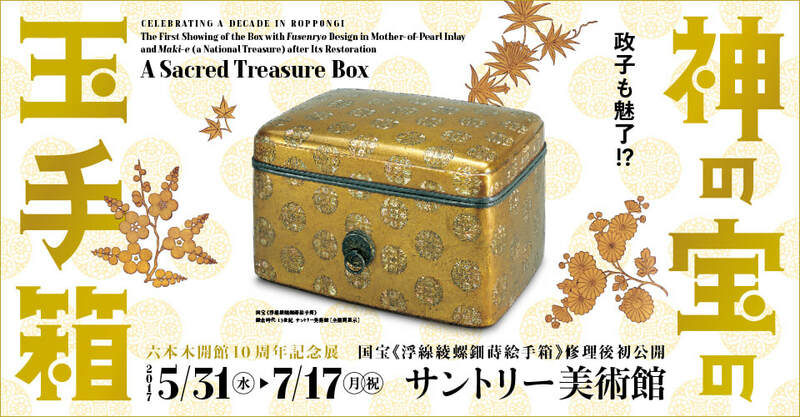 Japanese sweets "Saiko" from Wakuden in Kyoto and tea "Daitsu-an" from Ryoukoin's tea jar will be served to all conference attendees, free of charge. This promises to be a once-in-a-lifetime special tea. Don't miss it! Black raku chawan "Shunkan" by Chōjirō. Important Cultural Property. Mitsui Collection. Please bring a pair of white socks. ​Raku ware is a type of low-temperature fired pottery that was first conceived, designed, and commissioned by Sen no Rikyu, the great late 16th-century tea master and grandfather of the rustic style of tea known as wabicha that is commonly practiced today. Starting with the tile maker named Chojiro who first made bowls in this style for Rikyu, there have been fifteen generations of Raku family potters producing tea wares as one of the “ten craftsmen to the Sen family” (senke jusshoku). The May workshop will introduce the styles and techniques of Raku ware used in the tea ceremony. 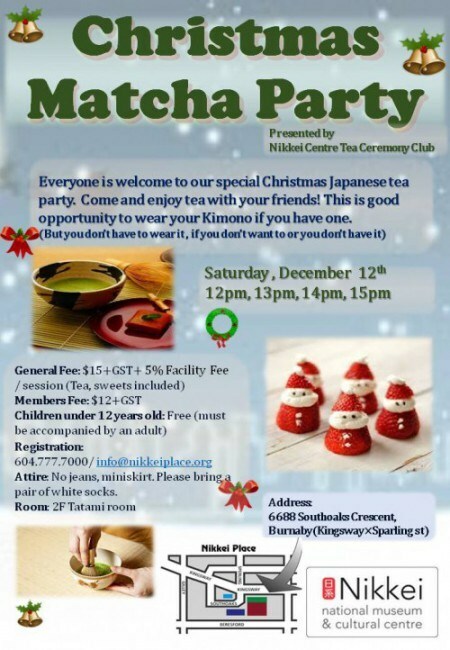 The slide presentation will be followed by tea and sweets in the Tatami Room. 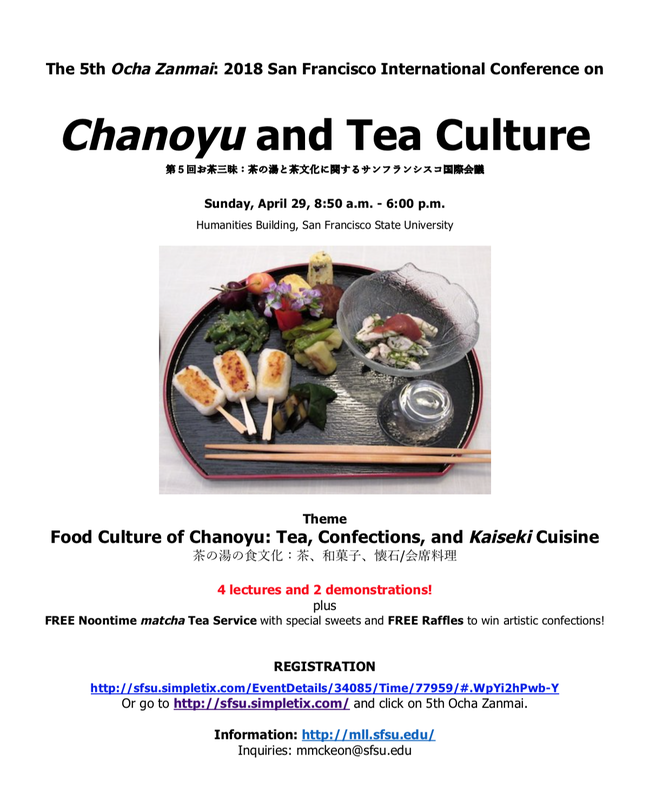 Half lecture, half hands-on, these workshops explore various aspects of the arts, culture, and history of tea ceremony followed by a seasonally-themed tea served in the tatami room. Workshops are conducted in English. No prior experience or tea school affiliation is required. Themes change for each session, so check the Nikkei Centre website regularly for details of upcoming sessions at http://centre.nikkeiplace.org/tea-omotesenke/ or email tea@maikobehr.com to receive email notices about upcoming workshops. Before entering a traditional tea room, guests pass through a special type of garden known as a roji. Sometimes described as a “mountain hut in the heart of the city,” the roji provides a buffer separating the special space of the tea room from the bustle of the world around it. For the guest, approaching the tea room in stages along this garden path prepares them to fully enjoy the tea ceremony that is to come. The April workshop will outline the main components of a roji tea garden and introduce the inner garden of the Fushin’an tea house at the Omotesenke residence in Kyoto. 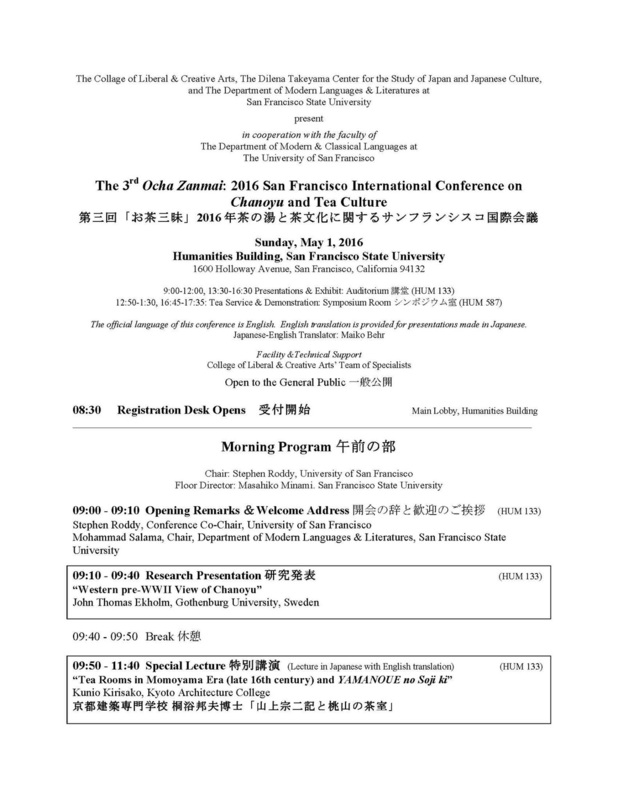 ​​On May 1, San Francisco State University will host the third Ocha Zanmai conference on chanoyu and tea culture. Once again comprised of presentations by special guest lecturers from Japan as well as presenters from around the world, this year's Ocha Zanmai will also feature a special exhibit of three chagama iron kettles by Ōnishi Seiwemon, the sixteenth-generation master craftsman to the Sen family as well as a chashaku-making demonstration and, of course, tea for attendees. Mr. Seiwemon Ōnishi, "Cha-no-yu-Kama: Beauty and Appreciation"
Dr. Kunio Kirisako, "Tea Rooms in the Momoyama Era and the Yamanoue no Sōji ki"
Please feel free to contact me if you have any questions about the conference or would like additional information. After his visit in 2015 as a Cultural Envoy of the Japanese Agency for Cultural Affairs, noh actor Yamai Tsunao returns to Vancouver in 2016 for a workshop on noh theatre's stylized movement and vocalization. A member of the Komparu school of noh, Yamai is active in bringing the noh tradition to audiences in Japan and abroad. He performed in Vancouver as the lead actor in Hagoromo in April 2014, and Continuity & Connection a concert of noh and jazz piano in February 2015. Yamai Tsunao's website (Japanese only) http://www.yamaitsunao.com. Joining him will be two other professional noh actors from the Komparu School, Muraoka Kiyomi and Kashiwazaki Mayuko. Workshop participants will learn sections of chant and movement from the noh plays and registration is open to to new students as well as to those who have studied with Yamai Tsunao in previous workshops. For more details call 604.607.5978 or contact info(at)tomoearts.org. This was a great workshop the last time around! I'll be interpreting again this time and look forward to seeing some new faces in addition to our participants from last year. ​Enjoy a Christmas-themed tea ceremony with sweets. All are welcome, and children 12 and under free can accompany an adult for free! Choose from one of the following hour-long sittings when you register: 12pm, 1pm, 2pm, or 3pm.